• Raw or cooked, your options with sunchokes or Jerusalem artichokes are wide open. Just as with potatoes, they can be baked, boiled, steamed, fried, and stewed. However, they will cook faster than potatoes and can easily be turned to mush in a matter of minutes if you do not monitor them closely. Keep your eye on them and remove them from the heat source as soon as you can easily pierce them with a skewer. 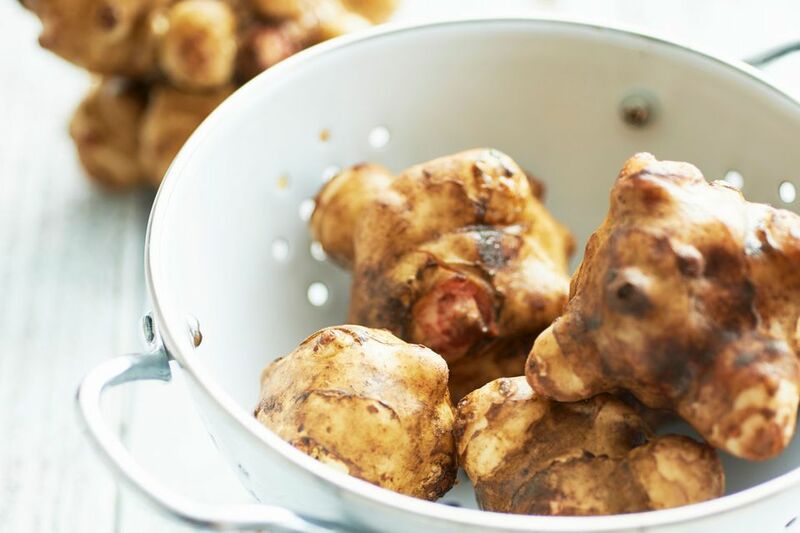 • Keep in mind that the flesh of Jerusalem artichokes will darken with exposure to air just as potatoes will, so if you are serving them raw, be sure to dip them in acidulated water. • Even after cooking, the high levels of iron may cause stored cooked sunchokes to turn gray -- not an appealing result. A pinch of cream of tartar or a bit of acidic (such as lemon juice or vinegar) liquid added to the cooking liquid will remedy this situation. Add 1/4 teaspoon of cream of tartar or 1 tablespoon of acidic juice per quart of water. • Be aware that acid will also strengthen the texture of sunchokes. If you want the finished result to be softer, add the acidic juice during the last five minutes of the cooking process. • Avoid aluminum or iron pans as these metals will cause oxidation turning the vegetable an unappealing dark color. • Suggested flavoring partners for Jerusalem artichokes include cinnamon, nutmeg, cloves, onions, and cream. They go well with just about any protein source. • Mashed sunchokes may be used as a thickener for soups and stews. • Try sunchokes instead of potatoes in your favorite potato pancake recipe. They may be substituted for turnips or parsnips in most recipes, so do not be daunted if you cannot find an abundance of recipes specifying Jerusalem artichokes.